Uptown’s Own Coyote Brings You Wild West June Wins! 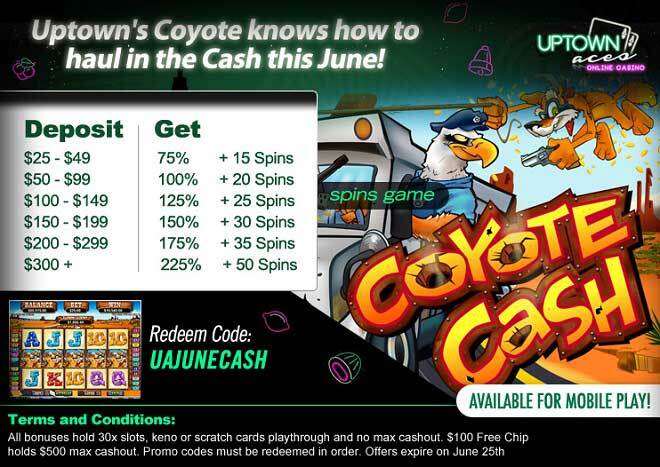 This June will be packed with the Wild, Wild West flavour when Uptowns own Coyote Cash take you on a winning adventure when with your deposits of as little as $25 to play with up to 50 Free Spins! Coyotes are known as some of the best runners of the wild - and this June you'll be known as one of the hottest winners when you land the wild symbol that pays double and will replace any other symbol (except for the scatter) to create wils wins. Land three, four or five scattered Bag of Gold symbols anywhere on the reels to trigger another 20 free spins. Western flavoured wins and Free Spins are happeinig this June when you hear the Coyote howl when you deposit as little as $25!